With three small hearts I make ​​this flower ... could be a rose? In Catalonia to "Sant Jordi " the streets are full of roses and books. What could I do with this crocheted rose and a book...??? to give away on the day of "Sant Jordi", right? So this bookmark will also will be Giveaway along with the garland of crochet! to participate in the Giveaway! so clever and nice!!!! Brava Cristina!!! What a lovely bookmark....have a great weekend. Preciosa aquesta rosa-punt de llibre! Petonets!!! What loveliness !~! Books are the best friends we can have. 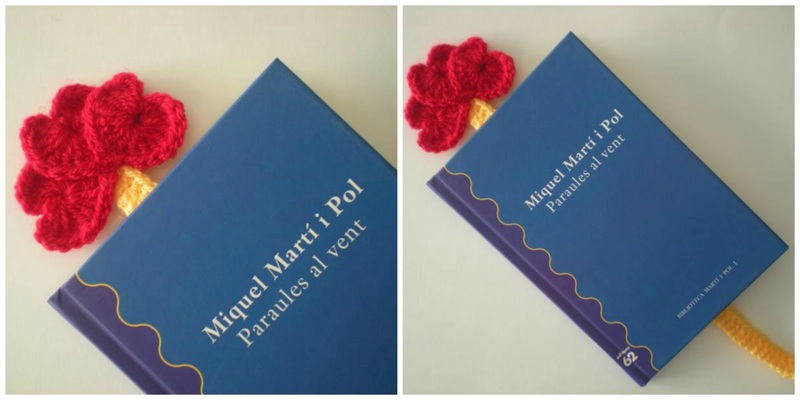 És un punt de llibre preciós i super original!